Consumer Product Safety Improvement Act could affect libraries; how about bookstores, Amazon? The Consumer Product Safety Improvement Act (H.R. 4040, 110th Congress, passed Aug. 14, 2008, text here govtrack reference to may result in libraries excluding children from their facilities or at least from children’s section. Taken literally, the Act would require testing for lead even in books if children can be exposed to them. It’s not clear if the same interpretation could apply to children in mainstream bookstores or even mail order. This seems to be an unintended consequence. Some self-published books printed with lower cost book manufacturers in the past could conceivably run into safety problems for stocking or when still in libraries. But the general impression among authorities is that this is a phantom problem. DelmarvaNow (the Eastern shore of Maryland) has an article by Maren Wright “At the Library: Lead may close book on children’s rooms in Maryland”, link here. It was also reprinted today (Jan. 29) in The Washington Times on p A20. Walter Olson has a story in Forbes, “Scrap the Consumer Product Safety Improvement Act”, Jan, 16, 2009, in three parts, starting here. The law was originally motivated by unsafe toys imported from low-wage China. Today (Jan. 26, 2009), the Business Section of the Washington Post has a story about Orchises Press, a small press run in a home attic by a George Mason University English professor Roger Lathbury, operating in Alexandria Va. The website for the press is this. The story, by Ian Shapira, has the title “For Publisher of Literature, Printed Word Is His Reward: Professor Specializes in Poetry, Classics,” link here. He publishes about three books a year, usually in January, and prefers poetry and less noticed classics. But recent changes in copyright law, extending the length of a copyright and delaying entry of recognized classics into public domain, has hindered some of his projects, a problem discussed in a book reviewed here Jan. 14, a work about intellectual property by law professor James Boyle. The story discusses the operation of his niche business, especially with academia, and his special interest in editing and presentation. He still uses an old Royal typewriter. 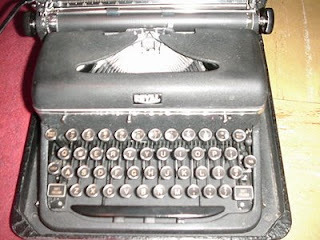 I happen to have the same typewriter (I think, shown in the picture), dating from the late 1940s; mine has elite type, but I typed many high school themes on it in the 1950s. His business was founded in 1982, just as typesetting and desktop publishing was beginning to advance, a subject of some controversy in its day. Writers Digest then, of example, used to recommend that writers buy computers specifically designed for word processing. Things would change much more rapidly than anyone could imagine. Writers conferences nearly always cover the small press market, because "New York" trade publishers have tended to downplay "midlist" authors, even before the current economic downturn. In the past few years, we’ve heard social conservatives talk about “demographic winter” and the danger that declining fertility rates among affluent populations in Western countries will invite aggression from the more religious and socially collective societies in the developing world (some of them associated with radical Islam), to the point that the development undermines western economic stability and democratic or liberal freedoms and governance. I’ve reviewed Philip Longman’s “The Empty Cradle” and Mark Steyn’s “America Alone”, and mentioned Kathtryn Joyce and her critical video, maintaining that all this is a very racist and “old argument” that calls not just for more babies but for “the right babies” (or “more white babies”). Even gay conservative author Bruce Bawer has developed this point in his book “While Europe Slept.” And there was the dark British film “Children of Men” at the end of 2006. Now there is a formal book from a think tank, the Center for Strategic & International Studies (CSIS) titled “The Graying of the Great Powers: Demography and Geopolitics in the 21st Century” with these authors: Richard Jackson, Neil Howe, Rebecca Strauss, and Keisuke Nakashima. The book is paper, large pages, 216 pages, ISBN 978-0-89206-532-5, with four long chapters. The authors do progressively nuance their concerns, but in the early part of the book they trace the historical fact that in earlier societies, large populations conferred political strength. This was so much accepted that men were sometimes penalized for not marrying early enough or not fathering enough children, such as in ancient Greece (Philip of Macedon) and China (Mo Zi), or even in Mussolini’s Italy. But after the Enlightenment, at about the start of the 19th Century, Thomas Malthus published his famous “Essay on the Principles of Population,” familiar to most high school civics students now (at least it was discussed in mine back in 1961). There is a bit of a cultural gap between individualistic societies and religious societies, as well as “Confucian” societies with “Asian values.” Individualistic societies value the performance of the individual outside of the family context and focus on adult expression. There may be more freedom and the appearance of a higher standard of living and self-expression, but it may not be sustainable with external influences, partly because, with less interest in having children, there is loss of personal concern about "generativity" -- what kind of world one will pass on to offspring or the next generation. Confucian and religious societies place more value on the relations in the blood family for their own sakes, and this goes beyond having and raising children; it includes filial piety as well. Faith-based societies usually have higher birth rates. Asian societies are mixed, with the one-child-per-family policy in China, but place more emphasis on inter-family dependency and less on the public sector. Western society is faced with lower birth rates and longer life spans, especially among non-immigrants. The population replacement in the United States is occurring because minorities tend to have large families but may be more assimilated than in Europe. The authors are moderately optimistic that this bodes well for American "power". Longer life spans mean that retirement must be postponed and that both parents must work. Gender parity and equality in the workplace may actually help relieve the economic strain, but would need to be accompanies for better benefits for families with children, including paid paternal leave (common in many western countries) which non-parents would have to subsidize – a sensitive political and moral issue. An aging workforce tends to change the attitude toward work. Older workers have more “wisdom” and more “crystalline knowledge” but are less “fluid.” As a result, they may be more conservative and take fewer risks of an entrepreneurial nature. (I don’t think that the record always bears that out; retired people have often started their own businesses.) People tend to reach their maximum productivity in their 30s and 40s, although their maximum pay may occur in the 50s (it did for me). Smaller families in the West influence social attitudes. Only children or first borns with fewer siblings tend to produce a more “conservative” set of business and competitive values. There could evolve cultural or political complacency that does not respond to the demographic and political “threat” posed by more fecund and for socialized populations. Societies with smaller families will resist war or military adventurism because of the fear of loss of only sons (although that may be a good thing, that the War in Iraq has been so criticized). The book does not specifically mention the “role” of homosexuality (Steyn did). However, on p 116 in Chapter 3 the authors offer a section called “Changes in Social Mood” and subsections called “Individual Psychology” and “Family Size and Structure”. The authors are clearly concerned that hyper-individualism can lead to an unsustainable notion of personal freedom. As I worked through in the previous book review, gay issues (especially for men) have a lot to do with the desire to decide for oneself (and often express publicly) what one values in people, outside the family, particularly after not being able to compete or fit in comfortably in the family according to conventional biological gender roles (especially procreation). So the findings in books like this have to be a major political concern for LGBT people. "Women and Children First": Resurrecting a 2002 book on gender differences (and it isn't what we want to hear); aftermath of "Dr. Phil"
During the immediate and “privatized” tugboat rescue of the passengers from US Air Flight 1549 which seaplaned into the Hudson River last week, we heard the phrase “women and children first.” While that line was heard in the film “Titanic”, we don’t hear if very often in a modern, technological, supposedly stable free society. We object to the idea that inborn biological gender can lead to unequal sacrifices for the common good, even though a couple generations ago the male only military draft presented a major moral issue. Last week, Dr. Phil created a bit of a media flap with a program involving transgendered children, particularly with his choice of one of his (“present both sides”) experts (on the “con” side), Dr. Joseph Nicolosi. Let’s say at the outset that transgenderism and sexual orientation are different issues, even if both related to gender. A quick check of Amazon showed that Nicolosi has authored some books on “reparative therapy” for homosexuality, and particularly this item from 2002, authored with Linda Ames Nicolosi: "A Parent's Guide to Preventing Homosexuality." (Call it a parent's guide to ensuring a biological lineage.) It is published by InterVarsity Press (IVP), with ISBN 0-8308-2379-4, and a little older (dated 2002). The description is “258 pages, paper.” I got the impression from the show that those against parents’ accepting transgenderism and homosexuality held their views on “moral” or religious grounds, and not science. I gave in to curiosity and ordered the book. The title of the book seems to trivialize its issues by suggesting that one can write a handbook for parents (but I’ve seen gay rights activists write handbooks for employers, so both sides play this game). The title would suggest (to a multiple choice test taker, anyway) that the book is intended for parents with only one son concerned about having a biological lineage. Sorry, he's not pulling our legs with this title; he's serious. He may not need a "rational" reason for his prescription, just "customers." Or maybe there is some coherent right-wing ideology. We need to know what he is thinking, if at all possible. Is there anything more to this than "monetary interest" driven by societal circularity? Never take a quasi-liberal status quo for granted in a world that has become so dangerous. Right after the Dr. Phil show aired, as I quickly checked Amazon I discovered that his first chapter is titled “Masculinity Is an Achievement” and is followed with a quote from Camille Paglia, “a woman is, but a man must become.” That resonated, and I thought he might be going down some real arguments. I wondered, though, why isn’t a woman’s bearing a child an “accomplishment”? Yet, I got the idea. Nature starts with a default of female; something has to happen to make an organism function with initiative (the male). Even the science of the “gay brain” assumes this. Indeed, the book is filled with rather typical “advice” for parents having to do particularly with (Freudian) oedipal problems, and material regarding the needed attachment of a boy to his father. (In a couple places, he suggests that fathers shower with their sons to help them get comfortable with their own maleness.) It even suggests that mothers often allow their sons to pick up on their disappointment with the intimacy they receive from their husbands. Indeed, marriage and parenting are very intimate affairs (not for everyone), and the tone of the book often projects this reality. He has harsh words for some groups, like PFLAG and Planned Parenthood, and isn’t afraid to bring up Dr. Laura’s awful phrase “biological error”. I get to a chicken and egg problem in this review, but, again, I really wanted to see a “moral” take on his position. In Chapter 8, “The Politics of Treatment”, on p 168, he (after allusion to gay male promiscuity and medical issues) writes that “traditionalists who believe there is a moral order grounded in nature’s design” (for biological gender) find “a warning that humankind does not have unlimited freedom.” That’s pretty much it. It’s a proxy argument for religion. Rather disappointing. But it does invite all the epistemology of Philosophy 101. I’ll take a crack at what he could have written in a moment – but then, he would get a different book, and one for which his rather abrasive title doesn’t fit. But the heart of the matter starts with challenging the typical liberal arguments about “immutability” and realizing that we find ourselves chased, by almost mathematical logic, into apparent contradictions and paradoxes that are difficult to face, whatever the best of intentions. People are born (effectively, whether by genetics, congenital factors like uterine hormonal influences on the brain, upbringing, exposure to infectious agents, etc) with a variety of abilities, capabilities, inclinations and aversions. I’ll start with what he makes a facile analogy. He says that people can be born with a tendency toward obesity or alcoholism. True, and we normally expect people to do something about these problems; we don’t accept the destructive behavior or medical issues that result, which others must often “pay for.” In a sense, everyone, we think, owns his or her own karma (we could get into whether there is “family karma” though). The analogy doesn’t quite work with sexual orientation. (In fact, the whole idea could invite abuse; imagine what totalitarian societies do with this kind of thinking, and just look at history.) Imagine a gay adult man in a monogamous relationship, or at least without promiscuous “unprotected” contacts. Is he unhealthy in the same fashion as implied in these examples? I think not. Or think about it in comparison to the “disability” paradigm. Someone with a learning disability (or communication disability like autism) must overcome this (or at least be accommodated) to be able to function independently in a market economy. Nicolosi proposes that gay men (or “prehomosexual boys” – he uses some overloaded words with rather moralistic-sounding effect, much as have a few other books, like Peter Wyden’s notorious “Growing Up Straight” from 1968) suffer a “gender deficit” (p. 44) as if it could be compared to an “intelligence deficit” or even a "moral deficit". (He also gets into the comparison to pervasive developmental disorders, like autism or asperger, but not many professionals would accept any relevance.) The “gender deficit” idea gets to be elaborated with discussions about playground bullying, incompetence in competitive sports, and physical shame. That does ring true for me, but the moral significance assumes something else: that everyone has a moral obligation to reproduce, or to help others who do reproduce. True, in Biology 101, reproduction is one of the most fundamental life processes, as is learning. The comparison (to obesity, etc) offends because, after all, the adult gay person has established an identity that, in a free market society, does really work and has become important to him or her. It’s true, it doesn’t use the usual socialization mechanisms of the traditional family, and may compete with the family, which I think helps explain a lot of the political problems. But it is so intrinsic to the adult that it seems immutable. Society, then (in his world), can presume it must interfere and make the emerging adult “want” otherwise unwanted intimacy with others (and usually rejection of unwanted intimacy is seen as a fundamental right). That implies that lesbians have a moral obligation to be receptive to men, for example. Nicolosi’s views would mess with the most personal and intimate and “private” (even if readily discussed on the Internet) portions of someone’s life. We begin to realize that Nicolosi’s idea of intrinsic limits on “humankind’s” freedom simply invites back the arguments leaning on immutability. There is, however, an existential trap that Nicolosi mentions several times. For example, on p 199 where he quotes an interview with “Dr. N” (is that “Dr. No”?) as saying “Many gay men … say that homosexuality places them above the average guy. They are the artists; they are the sensitive people, and the average guy is just a worker.” Boy, he’s reaching for Marxism here. “But paradoxically, at the same time, they are sexually attracted to the same type of guy they have contempt for.” There’s a lot more to develop here. Back in 1962, psychiatrists confronted me with the idea that I wanted to use announcing homosexuality as a way to "step on people's toes", get back at boys who teased me by making them aware of their own vulnerabilities. Nicolosi argues that less competitive males (“sensitive” people – and what we call psychologically feminine men) can become heterosexual, but he seems to overlook the intrinsic value of the sensitivity: sometimes such a person questions all the reckless risk taking around him and stabilizes it. I knew a gay adult who had learned to drive at 15 in rural areas, and never sped, never gotten a ticket, never indulged in any typical teen behaviors while logging tens of thousands of miles. I relate to this, but it’s a bit mistranslated. I felt attracted to men who were both “smart” and “strong”, not to “the proles.” (We had talks about this in the barracks when I was in the Army; it seemed in 1969 that the military, when there was a draft and men were needed, could be a more hospitable place for gays than a lot of civilian life.) But you see the process, and Nicolosi is right about that. I was the playground pariah, but I was the pianist, the musician, the artist, I knew what truth was. Why should I look to women for what I already had myself? It didn’t make sense. I needed real men. So I found myself “the judge” as to who really deserved the accolades of manhood, and I noticed that a lot of other guys didn’t. (A moment of candor: I did feel deep bodily shame [and "modesty"] about my own lack of physical presence and competitive competence, compared to other boys, during my "tween" years; I didn't pull out of it until I was about 15, well into high school, when it was "too late." During this period I noticed "something else." The fact that I’m Caucasian may matter a little; since white males may, relatively speaking, often have more body hair than other races, the differences in secondary sexual characteristics may invite more male visual “lock-on” to what psychologists call “part-objects”. Nicolosi reminds us that gay men often reject the effeminate in their own ranks and values conspicuous masculinity as something to be “achieved.” Racial differences may have to do with appearances, or may have to do with relative levels of affluence and “individualism.” Nicolosi calls this whole process of "upward affiliation" [in another writer George Gilder's parlance] a "self-reparation".) I became like the defeated chessplayer kibitzing at the remaining higher boards in a tournament. The psychological process is harmless on its face, and builds an adult identity, and it’s expressive. It actually works. But as it leaks out, it inspires resentment, and is eventually seen as a serious distraction to those who have taken on the burdens of having and raising kids in the socially supported structure we call marriage. It seems as though, right, I placed no importance on having a lineage myself (my own potential "vicarious immortality"), but in adolescence and young adulthood, men are typically more concerned about their own personal vocational and expressive issues and not about procreation. Civilization simply offers too many distractions. I could migrate here into the discussion of psychological polarity – that people are masculine or feminine regardless of biological genitalia, and in a stable society ought to have the surplus that gives them the opportunity for the relationships that bring their own fulfillment. Part of the problem with that might be that society isn’t always stable. We all have to be prepared and do our part. Sometimes there are priorities --- like women and children. You get where this is headed, to a more collective style argument, which I think Nicolosi wants to make. I think we need to run through it, like a river, perhaps. First, sexuality is different from almost everything else in our world in that it is predicated on elements of surrender and “irrationality.” Nicolosi points this out several times. Moral values about right and wrong with strongly individuated notions of “personal responsibility” don’t always work. A partner, and an experience with the partner is exciting partly because it is expressive, and, however private and consensual (legally) the circumstances, is imagined to have an “eventual” (in a mathematical sense) and then even “frequent” effect on the lives of others. Someone experiences a "surrender of self" of sorts for something more important (progeny) or expressive, which sometimes means that normal ways of thinking about personal self-worth and "personal responsibility" don't reliably work. Third, however, it’s true, we have to map all these ideas onto the mechanics of an individualistic society, which generally runs on the ideas of “harmlessness” and personal responsibility for chosen actions (and the libertarian ideas of property rights and “freedom to contract”). One way to look at it is to accept that some responsibilities are intrinsic merely for having been brought up and given certain opportunities that others don’t have--the "karma" argument, again. (If one was brought up this way, that is.) The market economy and money system can’t account for all of the obligations one has – just look at the debate now over national service, for example (or the way that, 40 years ago, student deferments from the male-only draft seems like such a burning moral issue -- that issue made this whole "moral question" about male "socialization" sound like one of physical cowardice, because if someone like me didn't fight, someone more "manly" might "sacrifice" in my place). So it’s reasonable so suggest that, if one is to share some of the “abundant life” derived from parents, which maybe others don’t have, one owes the obligation to accept the risk and uncertainty of providing the next generation. One can say that, even if we have some different inborn issues and propensities, we have some moral obligations to overcome them because the “real problems” in the rest of the world are so much greater. (Imagine that view when applied to anorexia.) One can go on with “moral” arguments like this, that really derive from collectivism. One thing seems to be happening, however. Technology, while providing the mobility and tools for personal expression and self-promotion, and creating new kinds of duties within families. Look at what is happening with the demographics of eldercare. Suddenly, people who did not have their own kids must care for their parents, who live longer and sometimes create a “childhood in reverse”. People without the skills to function in a social hierarchy (intrinsic in the normal heterosexist world) suddenly find themselves unprepared to deploy the authority they need to protect others. Likewise, the media makes us all much more aware of the need for “co parents” and role models (Nicolosi suggests that other family members like older siblings and uncles can rightfully be expected by parents to serve as additional role models and additional resources for raising children) – and that raises the obvious question about how “non conforming” men serve as role models when needed (and therein leads to the political debate on gay marriage and gay adoption, even gay teachers). Technology, in fact, helped create the Hudson River landing where we still needed to save “women and children first”. Fortunately, everybody came through this time. But the next time this happens, there might be real sacrifice. When your turn comes, you have to stand up, no matter who you are. And there’s the rub. I sometimes wonder, what if this technological world, that allows us these degrees of separation, were taken from us (even by aliens). Actual relationships, chosen or not, would be all that’s left. Competencies, and those that enable one to compete with others in a social hierarchy, perhaps do matter. But they need not be as closely connected to biological gender – itself a somewhat malleable concept in nature – as the author believes. Dennis Ayers, Associate Editor of "After Elton" has a great column mentioning this book (and "You Don't Have to Be Gay", by Jeff Konrad) in a criticism of how Amazon's search engine works in relation to gay-related keywords. The link is here, and the link (called "Best.gay.week.ever") showed up on a imdb's page for NBC's new show "Southland" (I don't know why it did). I love Ayers's "unsolicited" comment: "(Here's my bit of unsolicited advice to Amazon shoppers who might be interested in A Parent's Guide to Preventing Homosexuality: "Do everyone a favor and don't have kids!")" I don't have them (thankfully), but I wanted to explain what people like Nicolosi are thinking -- after all, Dr. Phil let him on his show as an "expert" without checking first! Ayers goes on to discuss the odd results from Amazon's searches as related to a policy letting users flag "objectionable content", inviting "flagging vandalism". On April 17, 2009 The Washington Blade reported "Amazon restores sales rankings for gay materials: Firestorm created after website drops rankings" link here. Barack Obama's "Change We Can Believe In"
Barack Obama wrote the Foreword, and eight speeches in Part 2 of the book, called “The Call”. The speeches are the Declaration of Candidacy (Feb 10, 2007), Iowa Caucus Night (Jan 3, 2008), New Hampshire Primary Night (Jan 8, 2008), A More Perfect Union (March 18, 2008), Father’s Day 2008, Renewing American Competitiveness (June 16, 2008), A World That Stands as One (Berlin, July 24, 2008), Election Night (Nov. 4, 2008). Part I of the book is called “Hope for America” and appears to be written by his campaign. It comprises several sections: Reviving Our Economy, Investing in Our Prosperity, Rebuilding America’s Leadership, Protecting our Union. It appears to have been written by the campaign staff. Photographs were contributed by Tim Llewellyn, Scout Toufankjian, Mikhail Metzel, Michael Schneider, and David Katz. The most interesting item is probably his Philadelphia speech, “A More Perfect Union”, where he recalls the history of the Declaration of Independence and writing of the Constitution. He talks about the apparent contradiction or paradox in the American Revolution: it was so idealistic, as emancipating man from false ideas of nobility or hierarchy, and yet it did not embrace all citizens, especially African Americans. Obama has often talked about Lincoln. In this speech, he does talk about the painful questions involved in debating affirmative action, and the possibility that a white person can lose an opportunity for which he or she is better qualified because of historical factors that he or she did not cause. But the greater problem, he says, is that real work and productivity is not rewarded properly anyway; it is exploited by a short term bottom line business value system that rewards non-sustainable behavior. Most of the platform material was written before the total financial collapse in September 2008, and some of it refers to high gasoline prices. Nevertheless, most of his positions reflect what would happen this fall. On military issues, he pays heed to the needs of veterans (so did John McCain, of course), job discrimination of returning veterans and reservists, and ending the “back door draft” or stop loss policies. The platform talks a lot about nuclear and biological terror, and recommends policies similar to those propose by Sam Nunn and the Nuclear Threat Initiative. His positions on Iraq and Afghanistan, and now Guantanamo, are all well known. But on the obvious “other” question about the military, he waits until later, in a brief paragraph on sexual orientation discrimination, to support ending “don’t ask don’t tell”, ENDA, and civil unions, and gay custody and adoptions. Yet, the DADT issue ought to be discussed in the military section, too, as it affects national security directly (especially in the intelligence and linguistics area). He talks about service a lot, and wants to offer tuition assistance or credits for national service. He says at one point that it takes a man to raise a child as well as to cause on to be conceived. While he talks about deadbeat dads and keeping marriages together (or having parents be married) and present fathers, there is at least a hint that some of the co-parenting ought to come from people who did not have their own children. That fits into the idea of service. But to include LGBT people in this effort and as role models for children, all the legal barriers that cause second class status need to be removed. He ought to connect the concepts of service and “equality” more directly than he ever does. His views on teaching come find in to this picture. He criticizes "No Child Left Behind" as not giving school systems the resources to carry out their mandates, and talks of dedicated efforts to train teachers. There is a problem in that teaching requires both academic or intellectual excellence and the ability to motivate others in a quasi-intimate way. There is perhaps an inherent personal contradiction involved because one's satisfaction in life must come from the achievements of others, not oneself. He talks about Internet security, and suggests that some critical infrastructure applications ought to be more shielded from access from the public Internet; but in the issue of protecting minors, he tends to go along with vigorous voluntary and market-based efforts rather than censorship. The book sounds reassuring to seniors about their social security and Medicare benefits. However, recent statements by Obama suggest a hard look at entitlements, and the idea that seniors with means could get fewer benefits, although those without means would get tax relief. There seems to be a bit of communism in this situation. The book proposes extending the Family and Medical Leave Act, particularly in eldercare situations, but it really doesn't get into the real controversy, which would be paid family leave. The “conservative” Washington Times ran a Martin Luther King Day essay, exclusive to the paper, today here. James Boyle's "The Public Domain: Enclosing the Commons of the Mind"
Title: "The Public Domain: Enclosing the Commons of the Mind"
Publication: Yale University Press, 2008. ISBN 978-300-13740-8, 311 pages, hardcover, 10 chapters, indexed. This treatise on the role of intellectual property law in both fostering and sometimes inadvertently discouraging artistic and economic innovation would, perhaps, make a mark for good book report in an AP government class. The book is meaty reading, with long sentences and small print. I sound facetious in introducing this book; it is one of the most thorough examinations that I have seen on the changes in the law that have come with the Internet (and all of its subtechnologies) and all related technology in the past thirty years. The author is a law professor at Duke. At the heart of the discussion is the role of copyright law, with its “relatives” in patent and trademark law. In a chapter 8, “A Creative Commons,” Boyle argues that copyright law actually does help set up a “commons” with instruments like a General Public License for open source software. It does so by specifying reasonable reproductive use, in good faith, in a manner that makes the original material more effectively deployed in the community. But copyright law does give the originator some rights to prevent misuse. The idea sounds a bit like “moral rights” as understood in Europe. However, the evolution of the law since the development of the Internet has been indeed haphazard, with many misunderstandings of what would happen when the public was turned loose. Boyle gives the history in detail, and some of it is worthy of being walked through here. He starts his argument with a “warning” by Thomas Jefferson to the effect that society should tread carefully in viewing literary content as “property” in the usual sense. Boyle gives the history of the Sony Betamax case, back in the early 1980s, which was the first test of the question as to whether a company whose inventions or services “facilitate” copyright infringement could be held liable for the behavior of its customers when noninfringing uses exist and are likely (the Sony Axiom). The Supreme Court, as we know, said no. He then discusses the "Internet Threat" which supposes an inverse mathematical relationship between the cost of reproduction and threat to publishing business models. But because speech and media has so much intangible and self-reinforcing value, the Internet (and Web especially) showed that such notions were not nearly so simple or dogmatic. But then, in the early 1990s, early government task forces suggested that the legal structure surrounding the Internet should indeed hold service providers responsible for customer behavior. That did not develop immediately, partly because Internet growth in the early and mid 1990s was not that quick, with AOL and Prodigy offering proprietary content and tending to be able to control customers with their notorious “terms of service.” But in time the Web took off, with ordinary people able to have their own domains, and search engines became enormously effective. Other technologies, like P2P and then BitTorrent, grew. Shawn Fanning developed Napster on his own laptop and launched a new company, probably not fully aware of the enormous challenge his product offered to the established music business (he just wanted to make it easier for college kids to get music). Napster, as we know, got sued, and this time the courts said that some downstream liability existed because of the central registry. Eventually Napster had to go out of business as a free service and be reinvented to become legal. But then other forms of peer-to-peer file sharing developed, without central registries. Eventually, home users were being sued for illegal downloads, and the case MGM v Grokster was heard. In 2005, the Supreme Court ruled that downstream liability holds when the “business model” is predicated on encouraging infringement. Boyle goes on to describe “The Farmers Tale”, where we make it illegal to do something (cut ranch fence wire) to prevent other illegal behavior but also prevent some legal behavior. He builds his analogy to a very detailed discussion of the notorious Digital Millennium Copyright Act (DMCA) of 1998, which makes it illegal to circumvent copy protection of various DVD players and other devices, even when the intended purpose would be “fair use.” The music and movie industries were effectively end-rounding fair use. They also regulated how DVD’s could be played back in various geographical areas (which could have been necessary for legitimate local compliance reasons). He goes on to discuss the tricky area of derivative works and mashups. In general, holders of music copyright are stricter in enforcing their rights with even very small extractions from their work (he talks about the Bridgeport decision). Can I legally write an publish on the Internet my own “Variations on a Theme of Dominik Maican”? (yes, his Second String Quartet finale plays in my head as I write this.) That’s complicated (no, I won’t). But the subject of music and fair use is obviously touchy, when you get into areas like jazz, where improvisation is so critical. (I’ve had several friends, all the way back to about 1971, who were into this.) One critical point is that copyrights last too long; he feels they should revert back to a much shorter period. (Eldred v. Ashcroft, deciding the Sonny Bono Copyright Term Extension Act, decided 2003, is here. Following on this is the whole matter of software (whether it is expression or invention), and then biotechnology. That’s where he gets into his discussion of the delicate balance between property rights and innovation, and how the legal environment should be structured. He even gets into whether new life forms could be protected. Then he discusses the issues of trying to protect data (or facts) which Europe does but the United States does not. (Can a recipe be protected?) Yet, the US has a more vital law data (and consumer data) business than does Europe. He explains why Westlaw works as a business (as does Books in Print) even though protection of “facts” does not exist as such. I note here that some news services, like the Associated Press, try to prohibit the “rewriting” of their articles, but since facts cannot be copyrighted, this does not sound quite kosher legally. At the end, Boyle reconsiders how the Internet could have evolved with much more controls, particularly in the area of downstream liability. Then there would have occurred fewer serious problems (like viruses, spam and predation) much innovation could not have been allowed. We might not have P2P at all, we might not have blogging or social networking sites or any of the “free entry” opportunities for self-promotion that are so familiar. Boyle doesn’t cover the censorship issues (like the CDA and COPA) and how these could have also stopped a lot of Internet growth, presumably because this is a book about intellectual property. But the concerns over censorship, and particularly online reputation, and now the need for tort reform seem as critical to the future of the Internet – and the average user – as does intellectual property law per se. The relationship between a person’s self-promotional global public speech and his or her social function is becoming a subtle but nettlesome concern in many areas. We still have a lot of dots to connect. The government’s main link for Copyright Law is here. Paul Krugman on "The Return of Depression Economics"
Title: "The Return of Depression Economics and the Crisis of 2008." Publication: New York: WW Norton, 2008, 191 pages, hardcover. The author is the recipient of the 2008 Nobel Prize in Economics. Fareed Zakaria pitched this relatively brief book recently at the end of one of his GPS hours on CNN. It appears to be an upgrade of earlier books with a bit of a turn toward the end, but the best way for a new reader to grasp the book it to do a “Benjamin Button” and think the book through backwards. He says we are in “depression economics” – and his thinking pretty much follows the views in the media expressed by people, generally “liberals” whom we connect to the main body of the Democratic Party now, ranging from George Soros to Ali Velshi and Suze Orman – we simply have to recognize the new kinds of risks that we constantly introduce into the financial system (and the real world, for that matter) and figure out the right principles with which to regulate them. We can live with “depression economics” for the time being while are markets are in intensive care (a term Orman uses) – even to the point of nationalizing some financial industries or processes – without re-living the 1930’s style Great Depression, which, when extended worldwide, would probably lead to war and real physical Armageddon. Of course, for many ordinary people now, we are in “a great depression.” That’s why we need to pay attention to what we can do for homeowners, for starters. The latest “culprit” is “non-bank banks” – that is, what we called investment banks (under Glass-Stengal) until recently, when they all collapsed in 2008. The problem is that they could take the various unregulated risks that exposed investors to more or less the same hazards as the run on commercial banks in the 1930s, even if technically the processes are more complicated. He explains how financial auctions work in that business, and how they can go wrong (the really did on a Sunday session on Sept. 14, 2008, just before Lehman collapses). More specifically, it was the way we securitized and “insured” the housing debt, after propping it up unsoundly. He gives a good explanation of how hedge funds are supposed to work – and what they really do is magnify gains and losses, rather than buffer them the way chemistry students would expect. Japan’s prolonged recession is particularly important because it demonstrates what Krugman calls a “liquidity trap” – the genesis of deflationary depression. He illustrates the concept with a simulated “baby sitting collective” where demand varies seasonally but where compensation is extra-monetary – in script. The “threat” of future inflation can be one way to treat a “liquidity trap” – if consumers really believe that cars will get more expensive again, then they’ll start going out and taking the deals now even if the auto manufactures are shaky given the latest bailout politics.